Building Collector: Santa’s Workshop at North Pole N.Y.
Santa’s Workshop at North Pole N.Y. I don’t know of any souvenirs from the real North Pole, but Santa's Workshop in Adirondack Mountains of Upstate N.Y. sold salt and pepper shakers of Santa’s House in the 1960’s. Originally, the metal S&P’s came with a metal tray. A colorful ceramic set was also sold. Founded in 1949 and designed by Arto Monaco, Santa’s Workshop in North Pole, N.Y. was a forerunner of present day theme parks in the United States. The Christmas-themed family amusement park in has rides, shows, storybook characters, a petting zoo and shops. On 16 December 1953, The U.S. Postal Service, recognized the great interest in North Pole, NY awarded it "Rural Postal Station" status . The same year Santa and his reindeer team traveled to the nation’s capital to participate in the Pageant for Peace and New York City's Thanksgiving Day Parade. One of the main points of interest here at Santa's Workshop, Santa's House is a picture of beauty any season of the year. 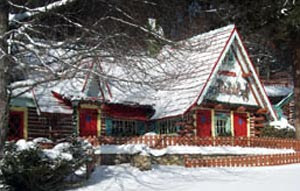 Inside the Alpine-Style house is Santa's Living Room where Santa personally greets every guest who comes in. Do you know of other Christmas-related souvenir buildings? I have a statue of Santa and a Reindeer from Santa's Workshop. I also have the North Pole from Santa Claus , Indiana.